In December of 2015, Frantz Group was contracted by a 3d manufacturing production simulation software company to help them achieve new business sales of $330K in new license revenue in North America in 12 months… and then double that the following year. Download our success story and see how Right Offers drive real business results. Previously this firm had generated most of their leads from referrals and trade shows. They had not organized formalized marketing efforts in the past and were not successful at building enough pipeline to make their revenue goals. They were stuck at their current size and not growing. We began our engagement with a Right Offer Workshop to align the campaign strategy with the company’s revenue goals. 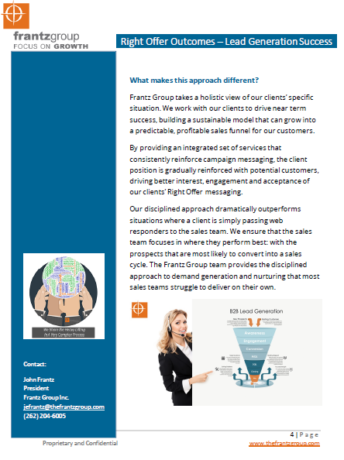 We were able to identify key areas of value based differentiation to use in their messaging. We followed the workshop with actual market entry campaigning spot lighting our client’s new “Right Offers”. Within 5 months of the workshop, Frantz Group generated a total pipeline value of $500K worth of sales qualified opportunities. In addition, we generated a funnel of active nurtures valued at $1.52M. The typical sales cycle is 6-9 months for a company not actively looking for this type of solution. We are happy to report that some of these opportunities are closing at the 2-4 month mark. Our approach drove rapid success selling to target companies that had never heard of our client before, nor did they have knowledge of 3d simulation. We saw a great improvement in MQL to SQL conversions with the addition of offers and a proactive outbound lead generation program. Now, 92% of FG leads are turning into SQLs. Prior to working with FG, they only had 23% of inbound web responders that were becoming SQLs. Our client’s sales team can now focus more time on closing deals than chasing unqualified leads. Download the success story to learn more, or contact us at 800-707-0064.